Bridgeport, a neighborhood on Chicago’s South Side, has long been an Irish-American, working-class enclave but has recently showed signs of change. The Public Media Institute (PMI) – led by artist Ed Marszewski, a longtime Bridgeport resident – took a proactive look at the neighborhood’s future evolution by making it the focus of its 12th Version Festival, an annual month-long community arts event. For the Bridgeport edition, the aim was to create a temporary autonomous zone: PMI invited cultural workers, activists, entrepreneurs, artists, designers, foodies, and dreamers to swarm the neighborhood, remixing twelve temporary spaces. 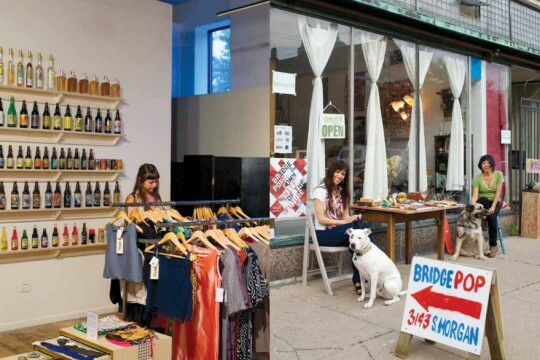 For one month, these pop-ups – including a bookstore, performance space, home-brewing clubhouse, galleries, shops selling locally made goods, and community kitchen – invigorated the area and provided a glimpse of potential long-term cultural and economic change.